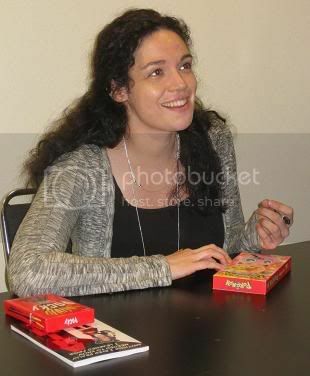 Archived Entry - 10/12/2008: "New York Anime Festival 2008 part 2"
10/12/2008 Archived Entry: "New York Anime Festival 2008 part 2"
The first autograph session of the day were the distinguished female voice actresses: Mandy Bonhomme (Juri, Revolutionary Girl Utena,) Rachel Lillis (Utena, Revolutionary Girl Utena,) Lisa Ortiz (Deedit, Record of Loddess War) and Veronica Taylor (Botan, Yu Yu Hakusho.) 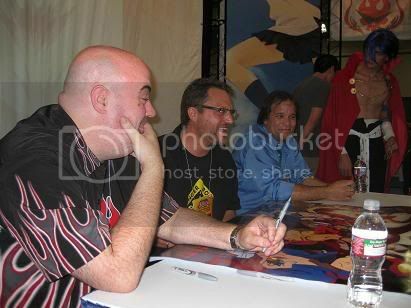 I did another run of the Dealer’s Room (and came up with nothing) before heading to the Bandai booth for the Gurren Lagaan signing at 3pm: Kyle Herbert (Kamina,) Steve Blum (Leeron,) and Tony Oliver (Director.) Of course, attending this signing made me late for the Yoshitaka Amano panel. Kevin Leahy was also the interpreter for Amano. 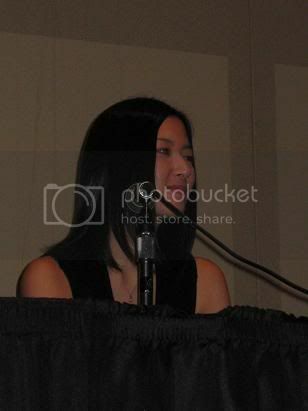 Yoshitaka Amano spoke about how Hideyuki Kikuchi never knows how long his stories are, so some pictures that were suppose to be in one volume end up being in later volumes. As for current projects, Amano is working on a Shinjuku project that takes place in the near future which involves the yakuza, various other 'unsavory' characters and subterranean monsters. When asked if Amano will have another New York exhibition the themed exhibit “Hero” in 1999, he commented that he would like another one. Fan: ‘Please, please, please!’ Amano: *nods* ‘Please!’ *crowd laughs* When he receives a project, he listens to what they (the creators) want and start drawing many of sketches. He chooses 5-6 sketches and shows them to the creator to get feedback before drawing some more. But he doesn't do as much sketches lately and at times, the 'rough sketches' is the finish product. He also gets his inspirations from places he has been...not just the atmosphere and surroundings of the place, but also from things (fruits/vegetables/objects) that are not found in Japan. There was also a giveaway at the end of the panel which consisted of several t-shirts. The way to get into the giveaway is to say something complimentary to him. My favorite was someone saying that Amano's work makes him feel as if he is dreaming even when he is wide awake. Others mentioned that Amano inspired them to become artists. My other favorite line was from a guy who stated something that is so true. Fan: Amano made sure that Final Fantasy is never final. At the end, everyone who complimented him played jun-ken-po (rock, paper, scissors) against Amano for the shirts. Yoshitaka Amano is the artist for the various Final Fantasy games, Vampire Hunter D novels as well as the illustrations and prose for Mateki: The Magic Flute. 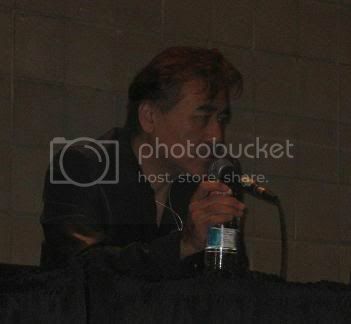 The panel hosts were the cavalcade of voice actors that attended the convention, minus the ones that were part of the Bandai and Funimation events. There were the usual 'How to be a VA?' questions and the usual 'Be an actor first' answers. For those that have attended voice actor panels before, these types of questions and answer have become the norm and much of it is repetitive. When someone brought up fandubbing as a way to practice, Tom Wayland provided an practical piece of advice: don't send fandubs to directors and studios since the dubs are basically licensed material that was used without the permission of the licensors. Another voice actor quipped that you shouldn’t move around too much during recording since movement doesn't really make your voice do more. (For example, large movements doesn’t increase the volume of a voice.) Another note is that it's fine to be shy...but you can't be shy when you're being recorded. Concerning the salary of voice actors, they noted that VAs don't usually earn a large sum of money and many have 'day jobs'. The pay is usually by the hour and it is not a salary wage. There was some background production info thrown around as well. When someone asked Mike Sinterniklaas about the cartoon 'Kappa Mikey', it was confirmed that tv studio productions prefer doing reruns if fans don't ask for more episodes since buying more seasons is expensive. Sinterniklaas encourage fans to voice their opinions if they truly want more episodes of certain cartoons, especially US-created ones. When asked about taking parts of anime in a different direction, Tom Wayland brought up Descendents of Darkness which was about 'gay detectives' and gushoshin who were spirits depicted as birds. Wayland described the gushoshin as 'undead chickens' since that was what they sounded like in the original Japanese. However, he had an epiphany that they shouldn't sound like chickens at all. Instead, he decided that they should sound like Barry White which was what they ended up with. *audience laughs* Some ADR directors don't want their VAs to practice their voices at home since they sometimes have a different direction with how they want the voice to be as well as a different direction they want to take the story. 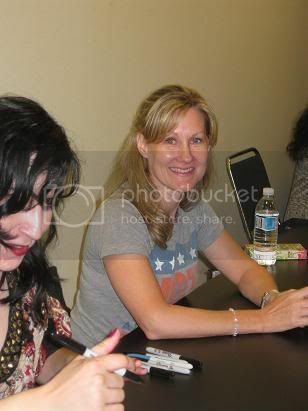 At a fan's request, Rachael Lillis did a line as Misty from Pokemon while Veronica Taylor did a line as the original voice for Ash Ketchum to the thrill of the crowd. Japanese and Shakespeare together. I never thought of it, but it makes for an interesting combination. The performance, ‘Shogun Macbeth’ consisted of a team of actors that had three different parts...only one of which I faintly recognized from the Shakespearean play. The first was a series of katana exercises, second was the appearance of the three hags and the third was a sword fight between three people. It was interesting watching them in action...though I barely understood what was going on. The masquerade was exceptional this year and I believe the standards were pushed higher due to the fact that the preliminaries for the World Cosplay Summit was held at this masquerade. The World Cosplay Summit is an international competition that focuses on performance and craftsmanship of the cosplays. 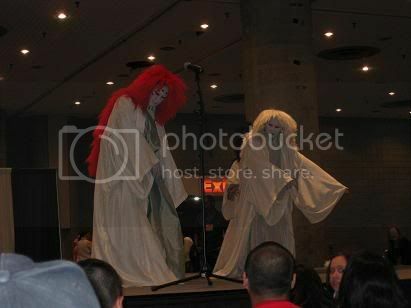 The team to represent the US was chosen from NYAF and the international competition will be held next year in Japan. Only teams of two are allowed to compete. The masquerade was also exceptional this year due to the mini-concert that Rie Tanaka held at the opening. Coming out in pink ears and a tail, she started singing Meer Campbell’s 'Emotion' from Gundam Seed, followed by 'Let Me Be With You' while occasionally cooing 'Chii!' from Chobits. She ended with 'Shizuka na Yoru ni', again from Gundam Seed as Lacus Clyne. I think everyone was in love by the end of the mini-concert. As mentioned before, there were many amazing skits. Links below are from acparadise recordings on youtube. Shoot for Top Shoot for it All - Won Best in Show and Runners up for WCS. There were 40+ ppl in the audience involved in a single part. 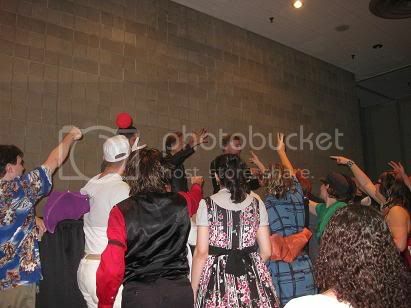 You can’t see them (since they were in the audience,) but the effect of the skit is there. These two were determined to win: they competed last year and this year and received Runners Up both times. I hope they don't give up because they're amazing. Gift of Luck - WCS winner. Truly beautiful skit in detail of costume and story. After the last skit, Team Osaka appeared. Team Osaka was the Third place winners at WCS 2008. They were invited to NYAF via Team USA. They did their performance from WCS this year and it was breathtaking. 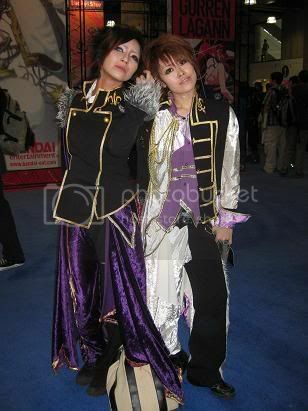 The style of their Code Geass cosplays is a take on visual kei and words could not truly describe the intensity of their skit. 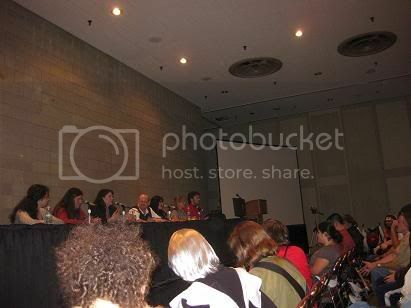 The panel was well underway when I arrived. Rie Tanaka spoke about doing a very late night radio show in Japan: she enjoys working although it makes her really tired. For this reason, she tries to keep really hyper. Her favorite character out of her roles is Suginotou from Rozen Maiden. There isn't any particular seiyuu (Japanese voice actor) that she enjoys working with. However, she likes working with her friends and they contribute to her performance. For example, Tanaka brings up Miyuki Sawashiro who is the seiyuu of Shinku in Rozen Maiden. Them working with each other built up Sugintou's character. The differences between voicing in an anime and video game is that several seiyuu record together in anime and she records by herself when she is recording for a video game. She has to imagine more about what other characters other say and act as well as work with the director more since she doesn't have someone else in the recording booth with her. Tanaka asked the audience who were gamers and who were the gamers in terms of internet gaming. She spoke about how when she was in school, she loves online gaming. *loud applause from audience* Tanaka: *laughs* ‘Why are you applauding?’ She speaks about the difficulties of finding time to play or playing too much. As a seiyuu, she needs to study the script before the recording. As an addict of the game, she plays on the train on the way to work. Currently, she is playing Final Fantasy XI online as Mithra, which is a feline type character. When asked how she came up with the voice for Simca from Air Gear, she mentioned that she read about the original story, discuss with the director and imagine how this character would sound. Linda asked about difficult characters and Tanaka brought up Lacus Clyne from Gundam Seed. Lacus was difficult since she was not very realistic concerning her role in the story. She doesn’t show a lot of emotions. The story is centered on war, but even when she is angry, she has to keep a certain style that is true to her character which was very difficult. Tanaka received much support from her director on this role. About Tanaka's role as Bianchi on Hitman Reborn!, she mentions that she feels that the character is very feminine and girly. She took a moment to speak to her manager before adding a piece of news: she will be playing another character on Reborn!. She is unable to say the name of the character, but asks that the fans look forward to hearing her voice again. When asked, she mentioned that she also felt that Fujo Kirie from Kara no Kyoukai was a difficult character to portray since the backstory was very dark with a background of a tragedy. However, the character changed a bit to become more feminine. When the topic of cosplay came up, Tanaka mentioned that there were more Chi then Lacus cosplays. She wonders about that...but I can easily explain that Lacus' outfits are much harder to make. Tanaka did several character voices, one of my favorites being a line as Lacus. What brought on an onslaught of photographs and fulfilled every fans' dreams was when the manager handed Tanaka a pink haro. Someone also gave Tanaka a Lacus plushie. At a fan’s request, she sang a bit from 'Shizuka na Yoru ni' accapella. There were giveaways at the end in t-shirts (which are small so the interpreter quipped that we can put it on our pillows,) cellphone straps, and cds. I didn't go to any of the concerts but there were many concerts that weekend. Like the Bandai booth, Funimation also had signings at their booth, but I wasn’t able to attend. There to promote Darker than Black was Jason Liebrecht as Hei and Brina Palencia as Yin. I wasn’t able to catch all the licenses that were announced but Yen Press has licensed Hero Tales by Hiromu Arakawa (mangaka of Fullmetal Alchemist.) Del Rey will have TSUBASA Character Guide 2 out in summer 2009 complete with color pages and guide exclusive art. XxxHOLiC: Another Holic novel by NISIOISIN is coming out October 28 which is later this month. Funimation has the rights to the Mushishi live action movie and there are plans for Ouran Highschool Host Club to be shown on tv. Bandai Entertainment has licensed the Gurren Lagann manga.